There are some sentences that you just want to hug tightly to you. For me, the ‘The Science of Dr Who‘ is one of those. I mean, really, what an extraordinarily combination. Science! Dr Who! And then you take those two things and wrap them up into a live stage show. I’m in awe. OK, enough gasping fanboy hyperbole. Is the show any good? The show sets itself up to “… investigate time travel and teleportation, ask if regeneration is possible, and explain how the TARDIS can be bigger on the inside.” It does all those things with explanations provided by real, live scientists. That’s both its strength and its weakness. On the day we visited, one of the scientists, Dr Martin White, was brilliant – the other two were OK, but looked mildly embarrassed to be there. Overall, though, there were clear descriptions of some pretty cool science. Given the audience was a mix of all ages, and levels of Dr Who fandom (think many fezzes in one room), the science was pitched at just about the right, albeit fairly basic, level. The whole thing was held together by the very funny Rob Lloyd, and by using scenes from Dr Who to connect the dots. It turns out Dr Who is an excellent conceit for a science show, partly because it has a history of science one-liners and actual attempts to explain some of the things going on. You do also need to be a Dr Who fan to appreciate the show though. There were liberal doses of Dr Who in-jokes and real-time polling on important issues such as whether the assistant in a particular scene was likely to fight or run and who is the deadliest foe. This is really a great show – a wonderful combination of the entertaining and the educational. 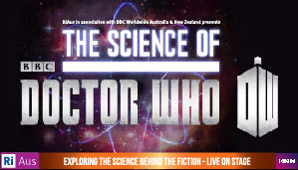 I highly recommend going if you have any interest in science and Dr Who – because did I mention? Science! Dr Who! RiAus is to be congratulated for its efforts in bringing The Science of Dr Who Live Show to Australia. Sadly for Sydney, the show is now moving on to Adelaide and Melbourne. Full details are here.